The toll in Nepal's floods soared to 120 as the disaster caused havoc mostly in the country's southern plains in the Terai, officials said on Tuesday. According to Nepal's Ministry of Home Affairs, 35 people were still missing while 39 were injured in the floods.As amny as 29 of the Himalayan nation's 75 districts were badly affected by the floods with 80 per cent lands having been affected while thousands of government establishments including schools, hospital buildings and pubic houses were damaged, Home Minister Janardan Sharma informed Nepal's Parliament on Tuesday. Nepal has already started distributing relief materials to the affected families and distributing Rs 200,000 each to the next of kin of those killed and Rs 10,000 each to the family whose house has been destroyed.Prime Minister Sher Bahadur Deuba visited the flood-affected areas on Monday and assured that no stone will be left unturned in the government's search, rescue, rehabilitation and support efforts. "The government has intensified the rescue and relief efforts by mobilising 26,700 personnel, seven helicopters of Nepal Army, six helicopters of the private sector, motor boats and rubber boats," Xinhua quoted the Ministry of Home Affairs as saying. 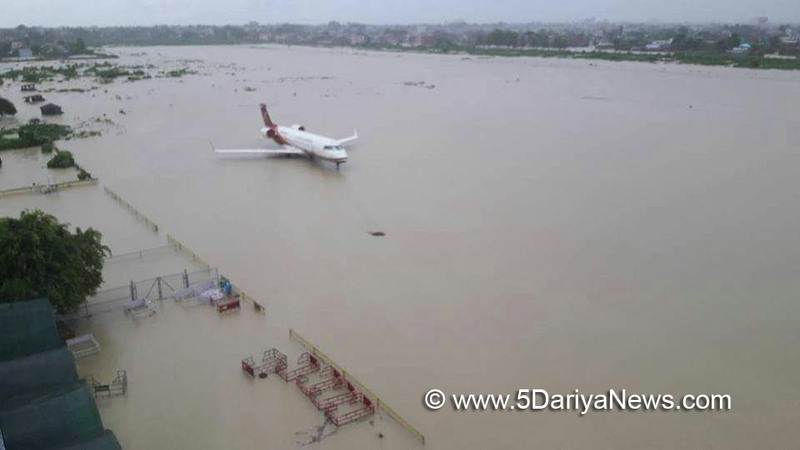 The monsoon havoc, which started on Friday, has affected the eastern, central and western regions of the country.A total of 50,000 houses were inundated across the plains. More than 3,000 houses were destroyed in floods that killed an estimated 400 livestock. Over 22,000 people were displaced by the flood.The ministry said the death toll was likely to rise, though according to the Department of Meteorology, cloud bursts have stopped since Monday afternoon.Some media reports in Kathmandu suggested that seven bodies, swept away by the floods, have been found in India. They were found near Jogbani Railway station on the Indian side of the border. According to police in Morang district, identities of three Nepali nationals, who were swept away by the flood near the Nepal-India border, have already been established.The inundation in Nepal has adversely hit the Indian state of Bihar where more than 6.5 million people have been affected by floods, that have claimed the lives of over 40 people so far, washed away thousands of huts, badly damaged buildings, roads, bridges and standing crops worth crores of rupees, officials said in Patna on Tuesday.In Nepal's Parsa district, bodies of two Indians have been found and their identities have been established, said the police.Meanwhile, chastened by the harrowing experience of distributing relief materials during the 2015 earthquake, the Home Ministry urged individuals and institutions eager to help the flood victims to follow the one-window system while distributing relief material.The ministry has assigned some dedicated areas to collect relief materials from individuals and institutions for effective distribution, it said.